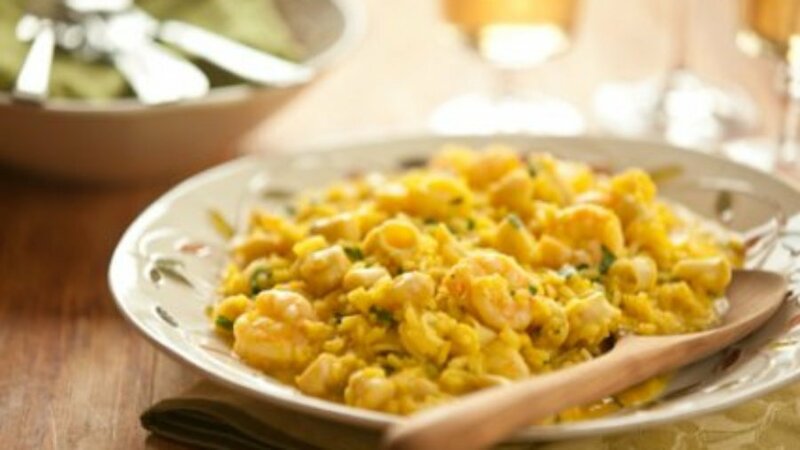 Mixed seafood and saffron make this simple risotto a spectacular dish. Clam juice adds a rich seafood taste to the cooking broth and the seafood itself releases liquids when cooked that are absorbed into the rice finishing the dish with a deep flavor. Heat broth, clam juice and saffron to a boil in a medium saucepot. Reduce heat and keep simmering. Meanwhile, heat oil in a large saucepot over medium-high heat. Add shallot and cook until translucent, about 2 minutes. Stir in rice and toast cook until translucent, about 2 minutes. Stir in wine and cook, stirring constantly, until liquid is absorbed. Set timer for 14 minutes and begin to add saffron broth, 1/2 cup at a time, stirring each time until most liquid is absorbed. After 14 minutes, stir in scallops, shrimp, squid and salt. Continue to cook and stir, adding broth 1/2 cup at a time until rice is al dente and seafood is just cooked through, about 6 minutes (you may not use all broth). Stir in parsley and serve.